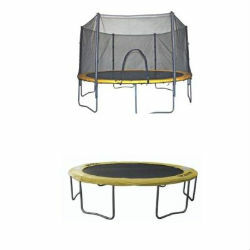 Health Canada is recalling AirZone and Variflex trampolines over a fall hazard. Band trampoline: model number 138635. Spring trampoline: model number 137337. Health Canada reminds the public that incorrectly assembled trampolines can allow the top rails and legs to bend or break during normal use, resulting in partial collapse of the trampoline. Bravo, which distributes the trampolines, has received 247 reports of top rails bending or breaking during normal use, with four reports of injuries. In Canada, Bravo said it is only aware of two reports of bent or broken top rails with no injuries. About 16,770 trampolines were sold at Canadian Tire and Sears Canada stores across the country from January 2007 to April 2008. Consumers are advised to stop using the recalled trampolines and contact Bravo Sports for instructions on how to inspect them for top rail damage and to request revised assembly instructions. Top rails and legs damaged due to assembly errors will be replaced at no charge by Bravo Sports.